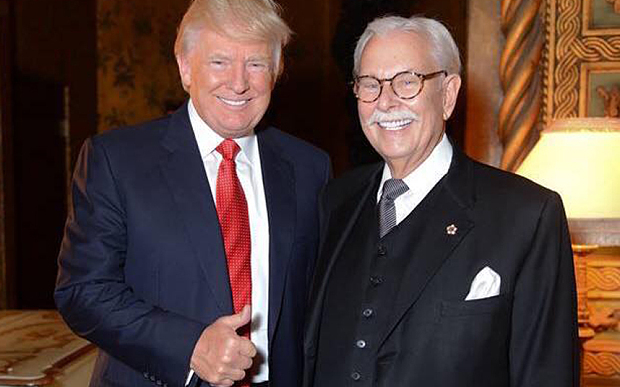 Those of you who perused today’s New York Times may have read the story about Trump’s longtime butler Anthony Senecal calling for the execution of President Obama. He rants ad nauseam on his facebook page about his hatred for Obama. This story was uncovered by Mother Jones. We can all shake our heads and say he’s insane or is suffering from dementia, but the fact is he has a forum for his hatred, and many people support his views. In 1990 Senecal took a couple years off from his butler-ing stint at Mar-A-Lago in Palm Beach, Florida to become mayor of Martinsburg, West Virginia. One of his proposals was to require panhandlers to carry “begging permits” at all times. What a tender-hearted fellow! Today, my employer and friend Donald J Trump announced he was running for the Office of President of the United States… NO ONE deserves to run for and be elected to this GREAT office, than Mr. Trump. !!!!! His love and loyalty for Trump seem to no no bounds. The Secret Service is going to investigate. These are the times that indeed try men’s and women’s souls. Maybe its Anonymous making good on its promise to disrupt Trump’s campaign. If so, it’s too little too late. I guess you can judge a person by his closest associates. Scary. Too bad being stupid and obnoxious aren’t illegal.